In this post I am going to explain you GST implementation setups required to be done as per practical experience. According to me GST setups will be very easy if you understand the process and setups in meaningful manner. So let us start one by one. GST Accounting Period creation is the very first setups need to done for GST. GST Accounting period setup page looks like above and it can be created via pressing ‘New‘ button available on the top menu list of Home tab. While clicking this New button system will create new line for you and need to enter starting date of GST Period. It should be between April 01 and March 31 format. Please close the GST period for April , May and June for current year (2017) to avoid un-necessary posting. Credit memo locking is entered 30-09-2018 due to as per government rule there is a time limitation after GST to create the credit memo when financial year closing happend. Annual return fixed date is the date that which government declared as last date of submitting the returns. 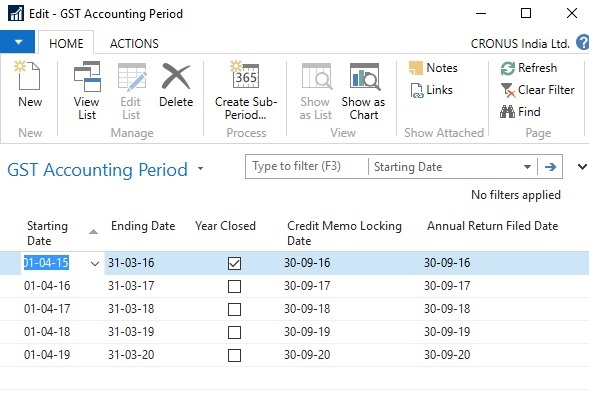 GST Sub Accounting period page is used to define the Month wise definition against the GST Accounting period created on the previous step. For creating the new “GST Sub Accounting Period” open the GST Accounting Period and go to Action Tab. Then click on to ‘Create Sub Period”. Enter the details to create the Sub Period values. Required to create some GL Account numbers for the tracking of GL Account wise transaction on system for GST transactions. GL Account Creation process please refer our Account Number creation post. Purpose each account will explain during next setups and upcoming process training post. For setting up State Code ( GST Reg. No) need to open State page and then enter the 2 digits unique State code for GST creation purpose. GST Registration Process explained as next step. Registration Number under GST is called Goods and Service Tax Payer Identification Number (GSTIN). 3 to 12 digit Should mention PAN number of the company. That means if one company having 3 location registered under different PAN number then need to maintain different GST number. GST Component is used to define the components of GST like CGST, IGST and SGST etc. You should enter the setup just like mentioned on above image. 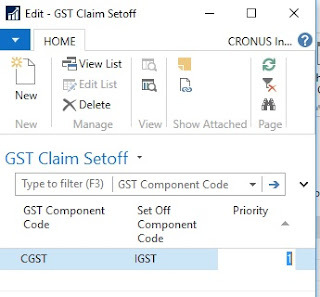 For doing the GST Claim set off setup required to open the GST Component Page first and then click on to ‘Get Claim Set off’ button. GST group is the place where Goods and Services of similar nature are grouped. Each group is assigned a group code. Remember by the help of this code only creating the actual GST setup. This page will look like following. For any GST Group, if the Place of Supply is different from what is defined in GST Dependency Type, then the same can be defined in GST Group Setup. 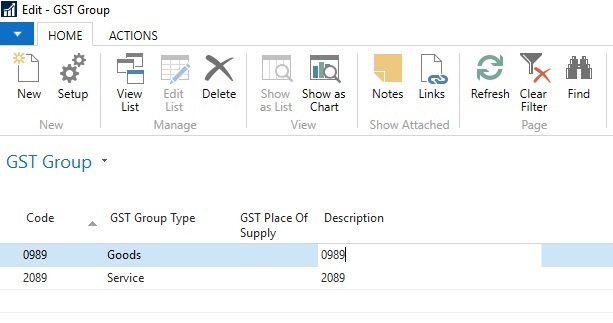 If for a GST group, Place of Supply is defined in GST Group Setup, then the same flows to GST Place of Supply field in Sales lines. If it is not defined, then GST Dependency Type shall flow to GST Place of Supply field in Sales lines. This GST Place of Supply field in Sales lines is a user editable field. 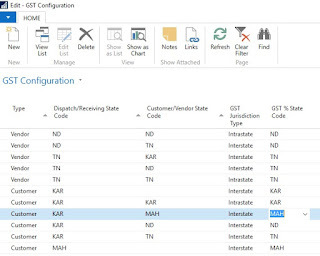 System validates shipping location state code and place of supply state code with GST configuration setup for any matching line and triggers the tax accordingly. Example: For Advertising Services, if Place of Supply is Ship to Address and the same is defined in GST Group, then GST Place of Supply field in Sales lines is auto-populated with Ship to Address. 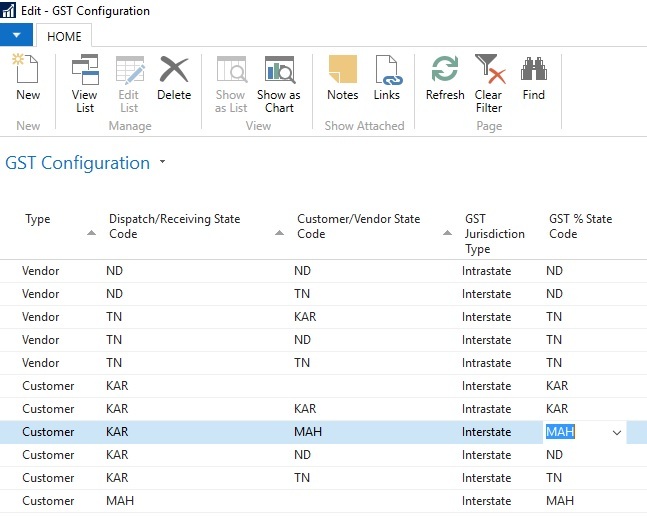 If the ship to address is, Karnataka and the shipping location is Tamilnadu, and then system checks for matching line in the GST configuration set-up and triggers the tax rate accordingly. Place of Supply can also be defined for each GST Group. Place of Supply is critical in determining whether it is an interstate sale or intrastate sale. Place of Supply can be Bill to Address, Ship to Address or Location address. If Place of Supply is not defined in the GST Group, then system considers GST Dependency type defined in Sales and Receivable Set-up as Place of Supply. 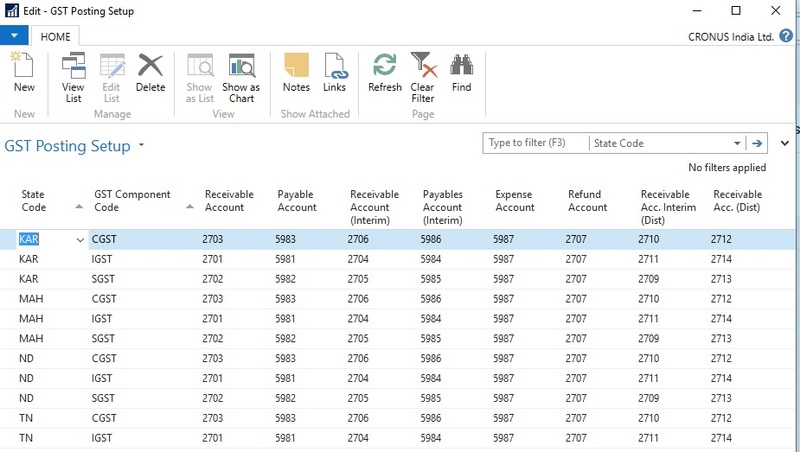 General Ledger Account for each component is defined state-wise here. Sample image of GST Posting Setup is as follows. 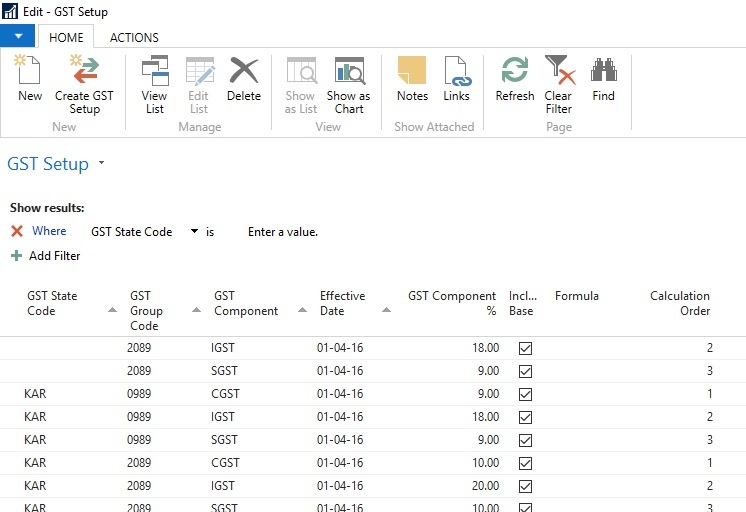 Following setups needs to setup on GST Posting Setup of Dynamics NAV. Determining the taxable jurisdiction enables the system to pick up the tax percentage applicable. For an export transaction, customer is located outside the country hence customer state code is blank. For an import transaction, vendor state code shall be blank, as vendor is located outside the country. The percentage and effective date for each GST component is defined state-wise here. If GST State Code is blank, then percentage and effective date defined for a GST Component is applicable for all states where there is no specific entry for such GST Group. For example, if Advertising Service has a uniform CGST rate in all states except Delhi, then instead of defining it for each state, it can be defined only once keeping state code as blank. A separate line can be created for Delhi state with Delhi specific percentage. A Registered Vendor is a person registered with GST authorities. A Composite Vendor is a vendor whose aggregate turnover in a financial year does not exceed fifty lakh rupees and has opted for Composition scheme. A composite vendor neither collects tax from the recipient of supplies nor passes on any credit of Input Tax. Hence, no GST is computed if the purchases are made from a composite vendor. A composite vendor has to register himself with the GST authorities and hence Registration No. is mandatory in Vendor Card, if the Vendor Type is selected as Composite. State Code is also mandatory. Persons whose aggregate turnover in a financial year does not exceed twenty lakh rupees are not required to be registered with the GST authorities. Such persons are called Unregistered Vendors. Any purchases from unregistered vendors attract Reverse Charge i.e. the purchasers themselves has to pay tax to the government. Interstate purchases from an unregistered vendor shall not arise, as any person irrespective of his turnover has to register with the authorities, if he is making an interstate sale. GST Vendor Type shall be unregistered in Vendor Card to handle this scenario. State code and GST Registration numbers are not mandatory fields for an unregistered Vendor. The purchasing user has to issue self-invoices under GST, if the purchases are made from an unregistered vendor. 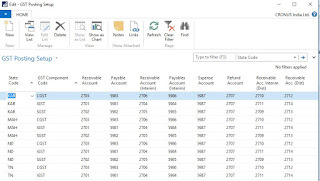 The user can issue a self-invoice in the system by selecting self-invoice from the dropdown of Invoice type in Tax Information tab of purchase documents. Bringing goods to India from a place outside India is import of goods. For Services, if the supplier is located outside India, the recipient is located in India and the place of supply is in India, then it is called Import of services. Purchase of goods and/or services from a foreign vendor is subject to Reverse Charge i.e. the person importing goods or services has to remit tax to the government. Import of goods are subject to both customs duty and IGST whereas import of services are subject to IGST. There is another scenario of importing services from associated enterprises. 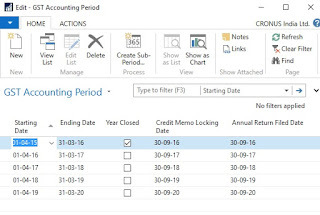 Accounting Entries differ in each scenario. GST Vendor Type shall be Import in Vendor Card for a foreign vendor. Registration Number and State Code are not mandatory fields in Vendor Card. A vendor who is exempted from payment of GST either by Central or State GST authorities is known as Exempted Vendor. An exempted vendor neither collects tax from customers nor pays any tax to the government. No GST Entries are generated in the system, if GST Vendor Type is exempted. This vendor type can also be used to handle a scenario where purchase of only certain goods and services from an Unregistered Vendor is subject to reverse charge and the remaining are exempted. (Law is not clear as of now). State Code and Registration No. are not mandatory for the exempted vendor in Vendor Card. GST Customer Type : Customer type can be Registered, Unregistered, Export, Deemed Export or Exempted. User has to select the appropriate Customer type from the dropdown. GST Registration Type : Registration type can be GSTIN (Goods and Services Tax Payer Identification Number), UID (Unique Identification Number), and GID (Government Identification Number). Appropriate type shall be selected from the dropdown. GST Registration No. : The 15-digit GST Registration Number shall be entered here. Registration number is mandatory if GST Customer Type is Registered or Deemed Export. GST Group Code : GST Group code relevant for the item/Fixed asset shall be selected here. GST Group codes created in GST Group Setup appears as dropdown here. GST Credit : GST Credit can be Availment or Non-Availment. This field by default displays Availment. If credit cannot be availed on any item/fixed asset, then Non-Availment shall be selected manually from the drop down. HSN/SAC Code: All HSN Codes for GST Group code selected above shall be displayed as a dropdown for this field. User has to select appropriate HSN code. Exempted: This field is checked if the item is exempted from payment of tax. GST Group Code : GST Group code relevant for Service/Resource/Item charge shall be selected here. 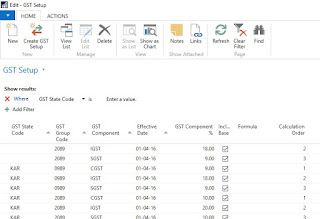 GST Group codes created in GST Group Setup appears as a dropdown here. GST Credit: GST Credit can be Availment or Non-Availment. This field by default displays Availment. If credit cannot be availed on any service, then NonAvailment shall be selected manually from the drop down. HSN/SAC Code: All SAC Codes for GST Group code selected above shall be displayed as a dropdown for this field. User has to select appropriate SAC code. Exempted: This field is activated if the Service/Resource/Item charge is exempted from payment of tax. GST Registration No. : The 15-digit GST Registration Number shall be entered here. GST Group Code : GST Group code relevant for the service shall be selected here. GST Group codes created in GST Group Setup appears as dropdown here. HSN/SAC Code: All SAC Codes for GST Group code selected above shall be display as dropdown for this field. User has to select appropriate SAC code. Exempted: This field is activated if the Service is exempted from payment of tax. GL Setup also required some setup to work the GST functionality properly. GL Setup will look like following section added after GST in India. GST Rounding Precision: This is used to define the GST rounding precision for the trasactions. GST Rounding Type: Here you can define the type of rounding precision working. You are having options of Nearest , Up and Down. That means if you have specified rounding precision as 0.5 and Nearest as Rounding type then system always try to bring the value to the nearest possible digit. IGST Payable A/C [Import]: Here you have to specify the IGST Payable Import account number. GST Recon. Tolerance: Max tolerance allows in GST. GST Distribution Nos and Distribution Invoice Nos are number series to handle the same. GST Calculation required all new Structure setup as well. Following image showing sample Structure for the GST structure. Keep on visit Navision Planet for latest updates and training documents for GST and latest changes in Microsoft Dynamics NAV.